Regina Drapery Centre Ltd. offers window covering services and products for both residential and commercial spaces. We also offer drapery cleaning and will repair broken blinds. We are dedicated to the personal touch of your interior design, and offer only the best in the industry. We are also proud to offer free installations to those in Regina! Our professional staff members are available for drapery cleaning services, repairs, and alterations as well. With comprehensive services and a variety of beautiful products, you are sure to find something that best suits the style of your home. Contact us to learn more and make a service request from Regina Drapery Centre Ltd. today. Cellular shades offer a unique look and provide greater energy efficiency in the home. The fabric material of these shades serves as insulation for the window, which keeps your interior rooms comfortable in either warm or cold weather. Our exterior shades are available for any outdoor space that includes a patio, deck, or porch. With a motorized lift option, these shades can be installed to provide shade and keep the sun out of your eyes for a more comfortable entertaining or relaxing environment. Layered shades are entirely adjustable to allow you to control the amount of light that is let in. The layered design includes sheer fabric and tightly woven bands – when combined, it offers protection for your furniture, décor, and other items from UV rays. The natural drapes we carry offer a beautiful aesthetic that blends the outdoors with the indoors. These options add a rustic touch and come in bamboo, jute, and a variety of grasses. Natural drapes are the perfect addition to windows, closets, and sliding glass doors. Add natural characteristics to your home with our shades, panels, and drapes. Choose from jute, bamboo, and grasses. These window treatments provide a natural touch and an aesthetic that is simply suitable for any room of the home. Folds of fabric offer a more solid structure to your shades and come in a variety of patterns to suit the individual style of your home. For greater privacy and optimized light control, these pleated shades are the perfect solution. Roller shades are simple to use and offer incredible protection that can be tailored entirely to your weight as well as opacity needs. We carry many varieties that include sheer, light, room darkening, and blackout. Sheer window coverings protect your interior décor from harsh UV lights, and offer a soft glow of light. With top quality in mind, the sheer fabric is one large piece of fabric that does not have any seams or stitches. Need quality covering for larger windows or patio doors? Sliding panels are the ultimate solutions and provide a simple experience in functionality. We install these panels with solar, roller, and natural fabrics to suit your taste. Solar materials offer an airy aesthetic and suit any décor of any room. These are considered classic shades and effectively block glare as well as UV rays, but still give you the freedom to enjoy the view outside your windows. Filters light and can be adjusted to provide a subdued view or to provide privacy. Night and day privacy varies according to fabric adjustment. Reduces reflections and glare on computer and television screens. Faux wood blinds offer a unique, decorated look that is suitable for your budget as well. These blinds are easy to use, clean, and give you all the power when it comes to how much light you would like to let in or keep out. Popular option among homeowners looking to break away from more traditional styles. The unique fabric combines the look and performance of traditional shutters and blinds with that of today’s modern roller shades, blending two styles into one design and maximizing on the benefits of both. These blinds are essential for large windows and doors. Thick, horizontal slats offer incredible privacy as well as durability since they are both scratch resistance and dust repellant. 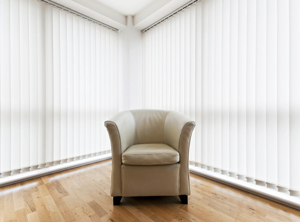 Vertical blinds offer a modern, beautiful look that provides top-to-bottom quality for any window or door. With a linear look, this option provides a bold statement that can be tailored to any interior look. In addition to our faux wood, we also offer plenty of wood options for a number of applications. For unmatched elegance and usability, these wood blinds can be entirely customized to your liking. All new window treatments including stage drapery and hotels. The Roman blinds we carry provide your space with depth and gentle folds that come in a variety of styles. These blinds come in looped, seamless, pleated, and balloon. These treatments are added to the top of your windows and doors for a special, eye catching detail for any room. With many beautiful ways to hang these pieces, you are sure to achieve the look you are going for. Composite shutters are highly efficient window solutions that are perfect for bathrooms, kitchens, and laundry rooms. The timeless look of wood is a stylish option that adds a touch of nature, as well as elegance, to any space in your home.